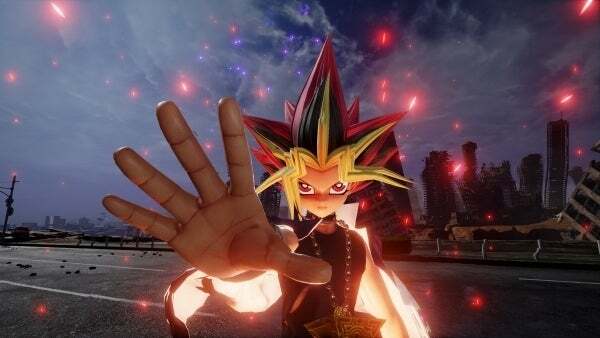 The highly anticipated anime lover's dream Jump Force continues to add impressive names to the game's roster and now Bandai Namco has announced one new addition: Yugi from Yu-Gi-Oh! The hero of the beloved anime series is bringing that iconic hair-do to the fight alongside other favourites from franchises such as Bleach, Hunter x Hunter, Dragon Ball Z, and more. According to Bandai Namco, "Joining the roster of Jump Force is Yugi Muto, the hero of Yu-Gi-Oh! Jump Force brings together the greatest heroes and villains from over the 50-year history of Shueisha’s influential Japanese manga Weekly Shonen Jump to fight for the fate of their world and ours." The studio also announced how he will play into the overall narrative and just how his grand debut in the game will go down, "Yu-Gi-Oh!’s story takes place in a world where a card game: Duel Monsters, is one of the largest aspects of everyday life. The game can bring fortune and fame to its champions, or demise to those less fortunate." They added, "The main protagonist, Yugi Muto, is a lonely boy who loves playing the game but was never blessed with talent. After finding and solving the Millennium Puzzle, an ancient and powerful artefact, Yugi unknowingly became host to Dark Yugi, the spirit of the long deceased Pharaoh Atem. The Pharaoh’s spirit possess and takes control of Yugi in times of danger, he is able to become one of the greatest Duel Monsters players in the world." We still don't have a release date for the ultimate anime and manga mashup but we do know it is coming next year for PlayStation 4, Xbox One, and PC. Are you ready? For even more amazing Jump Force coverage, you can check out our full Community Hub for the latest roster additions, sneak peaks, and gameplay footage! You can also sound off with your thoughts on the Yugi's arrival in the comment section below and tell us who you would like to see hit the anticipated game next!